Today I want to address one of my most frequently asked and important questions – how to choose a doctor. Here at FLO Living we believe in working together with doctors as part of your healthcare team. There are, of course, certain procedures, tests, and tools that you can only get from your doctor so it’s important that you work with someone who is respectful and understanding of your desired health goals. I think that there are 3 essential questions every woman must put to her doctor before sealing that on-going relationship. 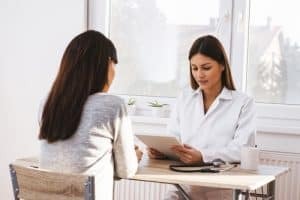 Those 3 questions should provide you with vital insight as to whether this is the right doctor for you, as well as establishing an open communication at an early stage in this important relationship. I know I’m making it sound like dating! But that’s because you should meet with a few doctors before you settle on the one, in that you don’t want to pursue a second, third, or fourth date and invest that time and energy with someone who isn’t going to give you what you need and is clearly signalling this fact early on. Cut the confusion and overwhelm by being direct-to-the-point and taking logical steps to establishing a long and nurturing relationship! The fact of the matter is that unless you are currently seeing a functional medicine gynecologist or obstetrician – and there are, unfortunately, few of those around – then you need to set your expectations appropriately and come from a point of open eyes and ears. It might take a little searching to find the kind of doctor you need. Most conventional doctors are trained in a particular way, that is to prescribe medication or recommend surgery to deal with symptoms and diagnoses. The issue with chronic menstrual conditions is that those two courses of treatment don’t address the root causes and create real recovery. You should expect a well trained physician to offer these two options up every time it’s relevant. And many doctors work from the belief that the majority of people will not be compliant to anything more complicated than a drug protocol (and even then they doubt you’ll remember to take the pill every day). So, they are often cynical about a patient’s ability to change their diet or lifestyle long term. And, I know it’s really tough to feel confident about and stick to a new lifestyle approach when your doctor is being unsupportive of your efforts. Not every doctor is like this. Many doctors embrace a wellness practice, believe in the power of food as medicine, actively pursue exercise and meditation and know that real health is achieved by many small daily practices done consistently over time. You want to find a doctor who shares your lifestyle and values! So, how to find a doctor who will believe you can treat your own hormonal health issues with food and supplements? One that doesn’t push for a medication or surgical procedure you might not want to pursue? One that does listen to you and wants to work with you as part of your larger health care team, along with us here at FLO Living? 1) What’s your personal health care regime? How do you take care of yourself? This might seem a little personal at first, but it can be so very insightful! Asking how your doctor approaches his or her healthcare on a day-to-day basis can show whether they will be open to self-care through food and supplements plus lifestyle changes. It can reveal whether they think taking good care of yourself in what you eat, what you do, and the choices you make can have an impact on your health goals. Finding out now whether they’re open to or resistant to the impact of diet on health outcomes is so important. 2) I’m really involved in my own self-care. Do you like to work with patients who come with their own research to discuss? You need a doctor who is happy to work with you in your plan to avoid medications or surgery and treat your hormonal health issues from a functional nutrition standpoint. They can be there to monitor the success of your plan along the way and provide the necessary support. They ought to feel that the more involved you are in your own health care the better your health outcomes will be. They should want their patients to take an active interest in participating, knowing that this will always yield the best results. If there’s a specific goal you have in mind at this time – i.e. you want to transition off the birth control pill, you should feel free to ask your doctor if they will support you in this. If they immediately pepper you with reasons not to make a decision you’ve clearly spent much time researching and considering, or if they are outright dismissive – then it’s time to look elsewhere for your doctor. 3) Check in with yourself: How do you feel in the presence of this person? Do you feel relaxed and calm? Or tense and fearful? Does he/she allow you to speak freely? This question involves listening in to how you feel when you’re at your appointment. If you feel rushed, talked-over, pressured, patronized, or ignored – then this isn’t the doctor for you. In order to get the important healthcare you need, you need to feel safe and calm in your doctor’s presence. You should never feel uneasy about making the appointment or dread an upcoming examination. Tune in to how your doctor behaves when you’re speaking and whether you’re given room to share and ask questions. Overall, you need to be a strong self-advocate for your own needs and health goals. If you feel you need support in asking these questions – take a friend or family member with you to your appointment. Take notes if you feel you want to look over the conversation at home. All-in-all know that your doctor needs to be someone who is open to your desire to pursue a natural treatment protocol and respects, even admires, your proactive and engaged interest in good health.